Armani Country Estates is a small community of 8 parcels, each about 12 acres. 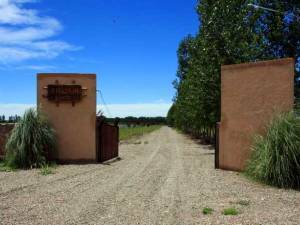 A gated front entrance, large storage barn/shop for owners use and the most beautiful breathtaking views of the Andes are just part of what is offered. 7 of the 8 estate parcels are sold. Lot #6, 11.97 acres, has not been planted because vines are not a requirement in this community. This parcel has been cleared and is ready for whatever your heart desires. 6 parcels are planted in vines at this time plete hands on maintenance/management is offered for any care your property would require or you can handle partial or all daily needs depending on your lifestyle and wishes. Free professional training for tending and producing top Estate wines is offered for any owner or leave the complete care and production to the management company. Mr. Hubert Weber (see bio`s on the internet) consults on the `vines and their success to high quality maturing and production`. Conceived and developed with the idea of providing a tranquil, stress free lifestyle for retirees and foreign owners interested in living full or part time on their estate parcel, Armani Country Estates offers a variety of options. Plant vines and join the other owners in producing high quality wine; plant one of the highest income producing products, Walnut trees; plant and raise numerous income returning plants such as roses, lavender, etc. or build your dream retirement/escape home with pool, tennis and landscape to your hearts content, watching the sun rise and set reflected on the grandeur of the Andes from your front porch or balcony. The cost of living, compared to the U. S. and Canada, is about 1/3 for all basic necessities and utilities. Electricity is on site and more than ample water is produced by the eight inch well which delivers over 150,000 liters per hour of pure spring quality. Neighbors such as Clos de los Siete (Michael Roland group), Salentein, Chandon, Lurton and dozens of others are just minutes away. Over 100 wineries, many international gold medal winners, are all within less than 10 to 60 minutes in any direction. Wine taste and dine on 5 star quality meals at many of these beautiful wineries most any day of the week. The town of Tunuyan is 7 minutes away and the town of Tupungato, with its 18 hole championship golf course (ready in 2010), is just 18 minutes away and Chacras de Coria, with its boutique shopping, numerous restaurants and 10 screen movie theatre nearby is just 50 minutes away. All offer medical, shopping, and daily necessities, restaurants, festivals, plazas, etc. etc . Terms possible with 60% down. Title is free and clear and can be transferred, under standard approval of Argentine law, to the buyer. Citizens from other countries can own clear title in Argentina.